Wetlands play a vital role in society, yet they remain among the most threatened ecosystems on Earth. In an effort to preserve wetlands, ESA began the GlobWetland project in 2003 to address these threats using satellite imagery. Three years later, the wetland and scientific communities are reviewing the role of Earth observation technologies in wetland preservation. Over one hundred wetland and Earth observation (EO) experts from around the world gathered at ESAâ€™s â€˜GlobWetland Symposium: Looking at wetlands from spaceâ€™ in Frascati, Italy, from 19 to 20 October to discuss the projectâ€™s achievements, the latest developments in EO for inventorying, monitoring and assessing wetlands and identifying the key scientific, technical and policy-relevant challenges for the future. GlobWetland is working in collaboration with the Ramsar Convention on Wetlands, which was signed in 1971 in response to the degradation of wetlands throughout much of the 20th Century and the growing understanding of their vital importance. Today more than 1 424 wetlands have been designated as Wetlands of International Importance, a total area of 129 million hectares. Speaking at the symposium, the Head of ESAC (Earth Science Advisory Committee) Prof Hartmut GraÃŸl said: "Thanks to ESA's support for GlobWetland and its data dissemination, the situation of monitoring single, several or nation-wide wetlands has recently improved rapidly." See also an in-depth interview on the topic with Prof GraÃŸl. Wetlands â€“ landscapes dominated by the presence of water near or above the surface â€“ vary in size with the smallest being around one hectare and the largest being nearly 7 million hectares. Often made up of complex and inaccessible terrain, monitoring ecological changes in wetlands without the use of satellites is very difficult. Vice Chair of Ramsarâ€™s Scientific & Technical Review Panel Heather MacKay said: "One of the weaknesses for Ramsar is that itâ€™s hard to see if we are making a real difference despite the fact that weâ€™ve been around for 35 years. Are there more wetlands? Are they in better or worse condition? These are valuable questions from Ramsarâ€™s point of view that the GlobWetland project can help answer through remote sensing and its different applications." Because the success of wetland conservation ultimately comes down to individual wetland managers, the GlobWetland products and services are user-oriented and based on specific requests of users across 50 sites in 21 countries worldwide. 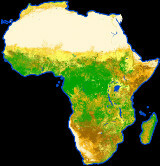 GlobWetland, funded by ESAâ€™s Data User Element (DUE), provides products for a wide range of terrain types to users across four continents: North and South America, Europe (including European Russia) and Africa, including Algeria, Egypt, Cameroon, Central African Republic, Chad, Niger, Kenya, Nigeria, Senegal and South Africa. 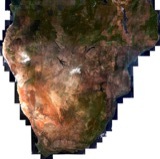 Based on the user requirements, GlobWetland core products include base maps, land use-land cover (LULC) maps and change detection maps â€“ with historical satellite images being compared with current acquisitions to see what changes have occurred during the last ten years or more. Water cycle regime monitoring maps are also being created using Envisat and Radarsat radar data to show flood and retreat patterns. "One of the powerful aspects about GlobWetland is that there are a series of two or three core standard EO products, but it also provides an additional set of products for each wetland manager depending on what their wetland is like so it really caters to individual needs," Ramsar's Deputy Secretary General Nick Davidson said. Specialised products available if requested include digital elevation models (DEMs) and biophysical data acquired from multispectral satellite sensors, showing vegetation health based on chlorophyll levels or the sediment contents of wetland water bodies. Vexcel Canada Inc is leading the GlobWetland consortium for ESA's DUE, with subcontractors Remote Sensing Solutions GmbH of Germany and Synoptics Remote Sensing and GIS Applications of the Netherlands. The Netherlands-based Wetlands International organisation is also taking part, both as a sub-contractor and as a link to the global wetland science community.